I visited with a friend in the summer of 1974, when taking photographs of the railways was somewhat difficult, to say the least, hence the rarity of colour pictures of steam in action in the country. A quick note on Polish locomotive classifications! A capital letter comes first: T (Towarowy) denotes a freight engine, O (Osobowy) a mixed traffic engine and P (Pospiesny) an express passenger engine. The second letter is in lower case and denotes the wheel arrangement: e.g. m = 4-6-2, k = 4-6-0, l = 2-6-2, y = 2-10-0 etc. If the locomotive is a tank engine, then the second letter is also a capital – K (Kusy), to denote tank engine, the wheel arrangement letter follows this! The letters are followed by a number: 1 – 10 denote ex-Prussian or Deutsche Reichsbahn locomotives; numbers from 11 – 19 denote ex-Austrian; 20 - 99 denote a Polish construction designed from that year! 100 and above denote miscellaneous designs. So as above, Ok1 is a mixed traffic 4-6-0 of ex-Prussian origin (Prussian P8), Ol49 is a mixed traffic 2-6-2 designed and built in Poland from 1949. 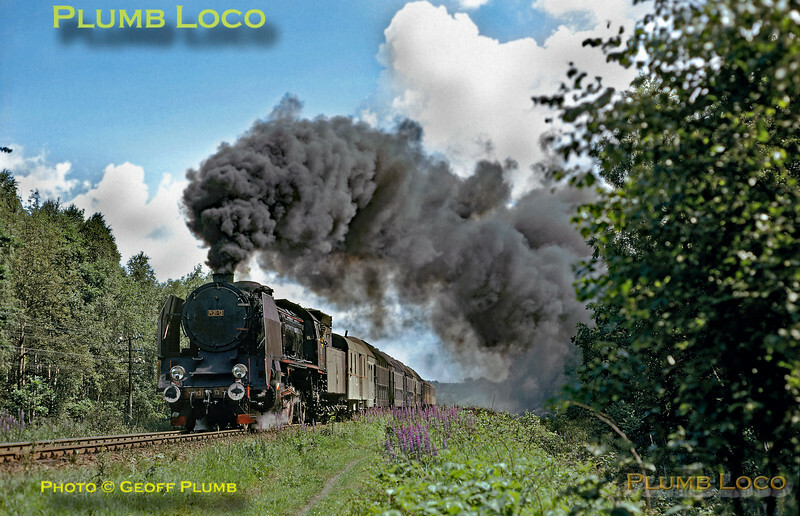 An example of a tank engine would be OKo1, which is a mixed traffic 4-6-4T of ex-Prussian origin (Prussian T18). Very complicated! I hope I've got that right, and apologies for not having the correct accents on letters - my English keyboard doesn't seem to support them! PKP (Polish State Railways) 2-8-2 No. Pt31-13 hard at work on the gradient near Krasnik with a passenger train from Lublin to Przeworsk, Monday 1st July 1974. The train consists of a baggage van, a set of four articulated double-deck coaches and two bogie coaches. Slide No. 13015.
the photos are fantastic ! Thank you.